It’s a fact! Our prayers have been heard and Android users will very soon be able to switch between multiple Instagram accounts within the App, without having to log in and out all of the time! Those of you who happen to have more than one Instagram accounts can relate to our excitement here at Lab3Web about this new feature. 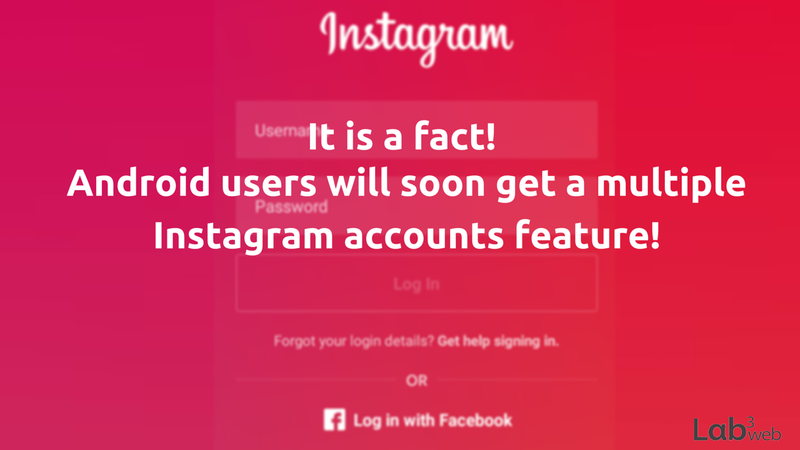 We all know how time consuming and tiring logging in and out can be, so the multiple Instagram accounts update will come to solve those problems for us. How exciting! The management of multiple Instagram accounts isn’t an important matter for a casual user of the app. However, to us Digital Marketers it is kind of a big deal. Can you imagine having to manage tens of different accounts and having to log in and out all of the time? It’s like hell. Even though I know there are a few apps that can help us manage more than one Instagram accounts, with this update we won’t even have to switch apps. Let’s see this new feature a little bit more in detail. Once the update is available a new option will appear at the bottom of the account settings page right underneath the “Clear Search History” option we will get an “Add Account” option. Just like that we will be hitting 2 birds with one stone (or to be more precise, as many birds as the accounts we will be using). For now though we have to keep our excitement down a little bit since the multiple account feature is only available for some of the beta testers and have the 7.12.0 version of Instagram. If you would like to join the beta testing community of Instagram all you have to do is enroll yourself as a beta tester, or download the lastAPK from the APK Mirror. If even having followed these steps you still don't get the option of multiple accounts don't be disappointed.Trust us we all want it very badly but we might have to wait a little bit until it is available for all of us. Let's just hope it won't take them much longer to launch the multiple Instagram account update.